Bridgeton Cross watching it all that day with my Granny, Ma and wee sister. Dalmarnock Road is top of the picture with Bridgeton Main Street the top right opening. And of course the famous Bridgeton Umbrella with its clock, erected in 1875. 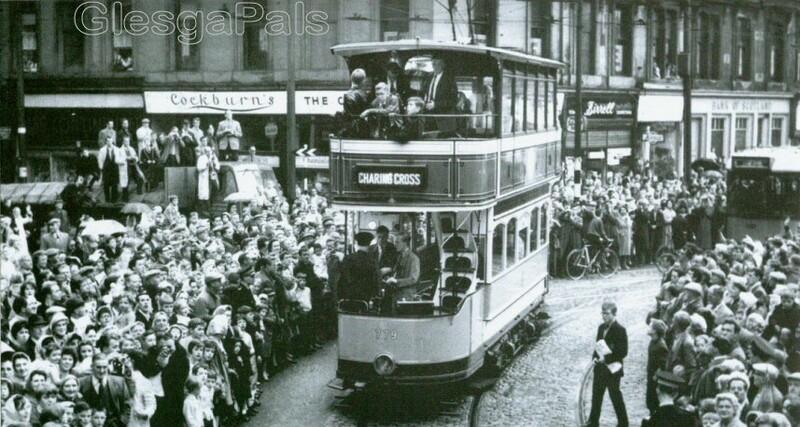 Bridgeton Cross early in its history used to be a Toll point and to this day us locals still refer to it as "the Toll"
An estimated 250,000 spectators lined the streets for the commemorative parade of trams on the evening of 4 September 1962. The heavy rain was regarded by many as the heavens weeping for the passing of the trams. The procession of twenty trams, led by horse-drawn tram No 543 dating from 1894. 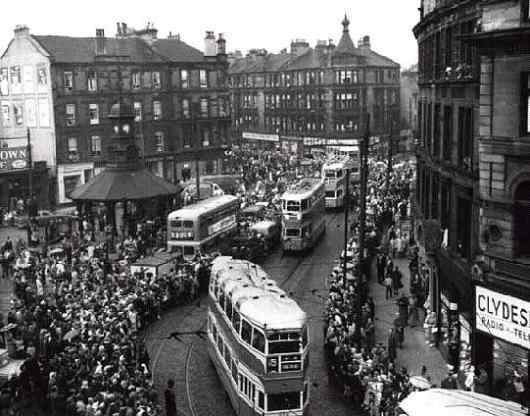 The parade left Dalmarnock Depot in Ruby Street at 6.30pm and proceeded through Bridgeton Cross then headed into the city by way of Argyle Street, Hope Street, St Vincent Street and Renfield Street to Coplawhill, where a huge crowd watched the trams enter the Car Works for the last time. Several of the trams which took part in the commemorative parade can still be seen in the Museum of Transport at the Kelvin Hall. Glasgow was the last major city in Britain to withdraw trams from service, although they have made a limited comeback elsewhere and their possible reintroduction in Glasgow remains a topic of debate. The picture shows folk with their brolly's up, aye the skies wept that day........ "
"....... I was 11yrs old in 1962 and was at the Ruby street depot watching the trams procession commin oot and turnin up taewards Brigton cross, it was just like a big party, wi hunners o' folk tryin tae catch a hudgy oan the very last tram, or awe the wains runnin tae keep up wi the caurs. When yi put yur penny oan the caur line yi hud tae watch it like nuthin else, or sumbuddy wid steal it...Noo its jist a vague memory"
"....... Shame they did away with them, just think of the great attraction that would be for Glasgow now if they had kept the trams. I was 14 in 1962 but I can remember getting the No. 18 tramcar home from school in Springburn, so it must have been one of the last routes still running." "I was 28 then, didnt see the last tram procession. my daddy was a tram driver for over 40 years working from possil depot. I dont think he could bear to watch that procession. he was offered job driving buses but couldn't hack it, he was 62 years old. he had to take job in cowcaddens subway, hated every minute of it. I can still see him off down the road to work, uniform immaculate, hat on straight, big chamois leather mitts under his arm. yes, the trams are sorely missed." "I have a halfpenny that the last tramcar ran over it was the number 18 in springburn my dad took me to see it ."